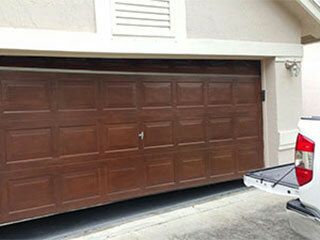 It is common for people to believe that garage door maintenance involves only cleaning and lubrication. However, there is a lot more to it. One of the most important things you must do is to test three major mechanisms responsible for the safe operation of the entire system. Find out how, right here. You should start by testing the opener safety sensors. These are the small devices set on the two sides of the door. One of them produces an infrared beam and the other one captures it. When this beam is interrupted during door closing, a signal is sent to the opener and it reverses the door. To test their performance, you need to open the door and place an object in front of one of the sensors. Then you need to initiate closing with the remote. If the devices work properly, the door won't go down. If it does, then they have to be fixed or replaced. The sensors work together with a safety reversal mechanism. It should be able to work alone as well as with them. To test its performance solely, you need to open the door and place an object, which does not interrupt the beam, underneath it. You can readily use a tall chair or a double ladder. When the door goes down and touches the object, it must reverse immediately. If it doesn't, then you'll have to get your opener repaired. The third test is for the torsion spring. It is used to find out how well it balaances the door. Disconnect the electric operator and lift the door half way to open position manually. Release the door carefully and observe its movement. Ideally, it should remain in place. If it goes down and hits the floor or shoots up, then spring adjustment will be necessary.